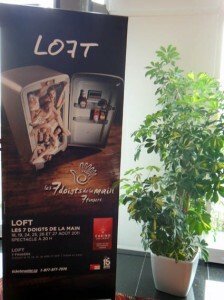 LOFT returns to Quebec! Les 7 doigts de la main are thrilled to perform the show which marked the beginning of their great adventure. The public will find Pat, Sam, Seb, Gypsy, Isa, Mimi, Evelyne and DJ Pocket on stage. LOFT will be back for six performances at the Théâtre du Casino du Lac Leamy. Created in 2002, LOFT was the collective’s first show. The show has since been watched by over 230,000 spectators in 19 countries. The 7 Fingers win Gold in Paris !